Forensic Multimedia Analysis: What's wrong with Photoshop? "The advantages of using a compatible video card (GPU) with Photoshop are better performance and access to more features. In this document, you will quickly find out everything you need to know about how Photoshop uses the Video Card (GPU) in your system including troubleshooting steps and features that have been recently updated to take advantage of the GPU. This document provides a quick reference guide to video card usage in Photoshop. Some features require a compatible video card. If the video card or its driver is defective or unsupported, those features don’t work. Other features use the video card for acceleration; if the card or driver is defective, those features run slowly." "To help guard against Photoshop crashes related to bad GPU hardware or drivers, Photoshop employs a small program called the GPU Sniffer. Every time Photoshop launches, Photoshop launches the sniffer. The sniffer runs rudimentary tests of the GPU and reports the results to Photoshop. 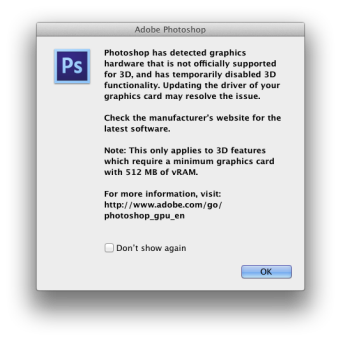 If the sniffer crashes or reports a failure status to Photoshop, Photoshop doesn't use the GPU. The Use Graphics Hardware checkbox in the Performance panel of the Preferences is deselected and disabled. The first time the sniffer fails, Photoshop displays a dialog indicating that it has detected a problem with the GPU. On subsequent launches, the dialog doesn't appear. If you correct the problem, either by replacing the video card or by updating the driver, then the sniffer passes on the next launch. The Use Graphics Hardware checkbox is enabled and returned to its previous state (enabled or disabled)."